Great news from the Atari 8-bit community, as Dave Theurers tube based shooter ' Tempest ' has been commercially released on the Atari 8-bit as Tempest Elite. 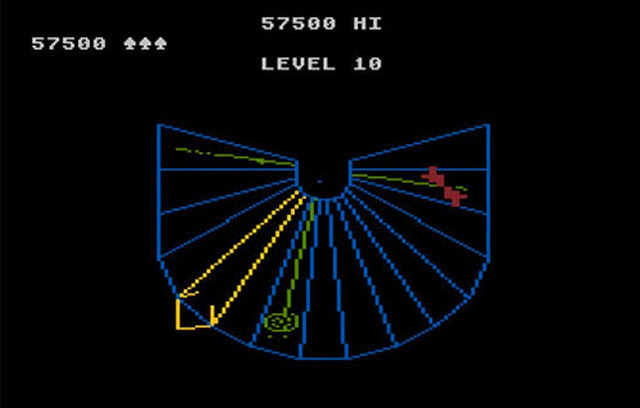 First released in 1981 on the Arcades, Tempest was released by Atari Inc and puts you in control of a claw like spaceship blasting enemies on a three-dimensional surface, divided into multiple segments or lanes. A great game for its time that's still worth playing today, is ready for purchase as a cartridge price at $49.95. Tempest Elite has been in development on and off for almost 5 years by Peter J Meyer & Lance Ringquist via the atariage community. It will require a 64K Atari with a cartridge port and runs on a standard Atari OR an Atari with VideoBoardXE. The game features many more levels and changes including up to 24 lanes, that can be opened or closed with many different shapes.